Santa Barbara, CA, March 02, 2019 --(PR.com)-- Book publisher, In Color has released another great volume, "The Medical Cannabis Primer." 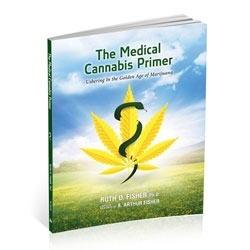 This compendium by Ruth D. Fisher, PhD, provides easy-to-understand, comprehensive information about medicinal cannabis for patients and healthcare professionals. Helps users and prescribers determine if cannabis is appropriate for the patient's use, and if so, how to prescribe and dose medicinal cannabis. Introduces all the basic concepts surrounding the production and use of medicinal cannabis. This 144 page volume contains 38 photos, 12 illustrations, 8 graphs, and 27 tables, all designed to make the information easy to digest and learn. ISBN 978-1-885176-02-8. "I’ve never seen anything so complete, properly compiled, and easily comprehendible for literally anyone interested in seriously learning about cannabis as medicine," says Mike Robinson, Founder of the Global Cannabinoid Research Center. Angela Hardy, Pharm.D., Cannabis Educator, and Cannabis Clinical Consultant says, "This compendium provides an unbiased, clear and concise overview of all the key information and supporting evidence for medical cannabis. This is precisely what every patient and healthcare provider needs to start making informed and rational decisions about the use of medical cannabis." And Ryan P. Basham, M.D., continues, "This primer is very well done, very thorough and well-researched. The tables and graphics make it much more 'digestible' in comparison to a medical text. This is an asset for potential patients." The Medical Cannabis Primer is available now from medicalcannabisprimer.com. Beginning in April, it will be available in bulk quantities for resellers. In Color has been providing graphic design, communications, and publishing services since 1986. Visit them at: incolor.net.